In October, workers at Sabah Forest Industries (SFI) in Malaysia voted to certify the Sabah Timber Industry Employees Union (STIEU) as their collective bargaining agent after years of “union-busting” by SFI, a company supported by a 2014 investment from the International Finance Corporation (IFC, the private sector arm of the World Bank), as summarised in an October report by the Building and Wood Workers’ International union. In April, the Compliance Advisor Ombudsman (CAO, the IFC’s accountability mechanism) completed a compliance investigation into SFI, as submmited by the union on behalf of STIEU in 2015, regarding concerns about freedom of association and project compliance with the IFC’s second Performance Standard (PS2) on labour (see Update 67). The CAO found that, prior to the approval of the project, the IFC did not correctly apply PS2 standards and its pre-investment review and mitigations of risks in relation to union recognition were insufficient. Following approval of the project, it found that the IFC also did not meet its PS2 obligations, including by suspending monitoring because the client claimed it intended to sell the plant and requested that monitoring not take place. Pointing out that “membership of a union that can negotiate on behalf of workers in relation to these types of issues is a right under international law,” the CAO concluded that, “shortcomings in IFC’s review and supervision of this project have contributed to adverse outcomes for the complainants…As a result, workers have been deprived of representation.” Union General Secretary Ambet Yuson commented, “The tragedy of IFC’s intervention at SFI is that they had the capacity to improve the situation, but…failed to do so at each step.” He went on that the IFC, “had adequate information from the outset that SFI was violating workers’ rights to freedom of association and collective bargaining; however, this information never made it to the Board,” reflecting wider civil society concerns around accountability (see Observer Winter 2018). In a May response by IFC management to the CAO report, the findings are described as “valid observations” and it is explained that, in this project, the IFC primarily focused on other risks. 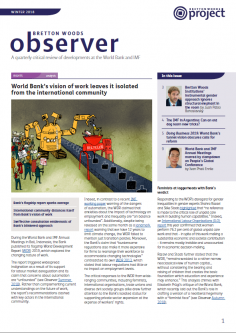 It ended on the commitment that, “Moving forward, IFC will more prominently identify Freedom of Association risks in its Board reports.” The IFC’s lack of focus on and sensitivity to labour rights in this case seems regrettably part of a broader institutional trend within the World Bank Group, as evidenced by the lack of emphasis on workers’ rights in the 2019 World Development Report on the changing nature of work (see Observer Winter 2018).